HOT DEALS: Save up to 40% on electronics in the Play.com sale | What Hi-Fi? A Hannspree 19in SJ19DMBE Freeview, HD-ready LCD TV is yours for £120, an LG 19LH2000 for £125 and a Samsung LE19B650 for £135. Want something bigger? Then how about a Samsung LE32B350 for £275, a Sony KDL-32S5500 at £280 or a Panasonic TX-L32C20 for £300? Another £100 will buy you a Sony KDL-40EX403 or KDL-37V5500, both Full HD sets with Freeview. Splash a bit more cash and you'll get a Panasonic Viera TX-P46S20B HD plasma for £675 or a Samsung PS50C550G1 50in Full HD plasma for £700. Blu-ray player deals include the Award-winning Sony BDP-S370 and Samsung BD-C5500, both at £99.99, the Panasonic DMP-BD45 at £89.99 (with free copy of Avatar on Blu-ray) and Toshiba BDX-1100 at £69.99. And if you want an all-in-one Blu-ray system, the Award-winning Sony BDV-E370 is all yours for £280. Need a new pair of headphones? Play will sell you a pair of in-ears for less than a fiver, in the shape of the Sennheiser MX6 at £4.49. But we be tempted by the superb Sennheiser CX300 II at just £12.73, our Best Buy in-ear headphone at up to £50. 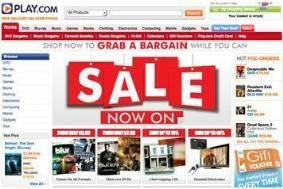 You'll find hundreds more bargains in the Play.com sale, so head on over to the website and have a hunt around.